High performance meets visual intrigue in the Corum pendant by Tech Lighting. 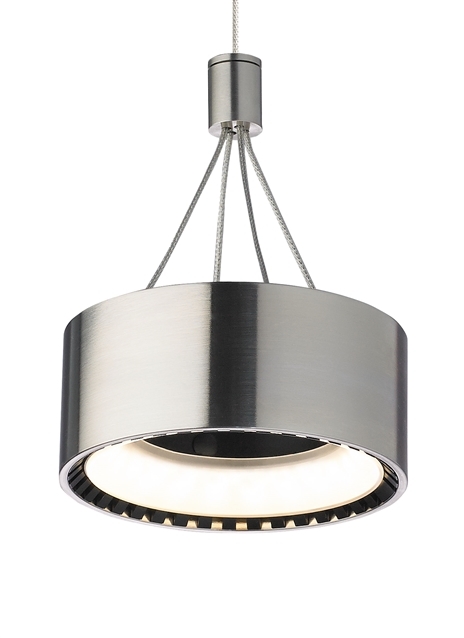 This unique LED pendant is defined by its open center, thin metal frame and exposed geometrical heat sink allowing it to provide a bounty of task lighting to surfaces below. With its high-end industrial design and modest scale, the Corum is ideal for kitchen island task lighting, hallway lighting and home office lighting. The Corum ships with 12 Volt LED lamping and is fully dimmable to create the desired ambiance in your special space. Pair the Corum pendant with the Kable Lite system by Tech Lighting for greater design customization. Inspired by the latest in automotive headlamp technology, when viewed from above, the center glows with a hint of illumination. Includes 5 watt, 500 gross lumens, 3000K LED. Ships with six feet of field-cuttable suspension cable. Dimmable with low-voltage electronic or magnetic dimmer (based on transformer).